so I can now take up Polevaulting should the mood strike. followed by a show in Pisa., Tuscany in April. 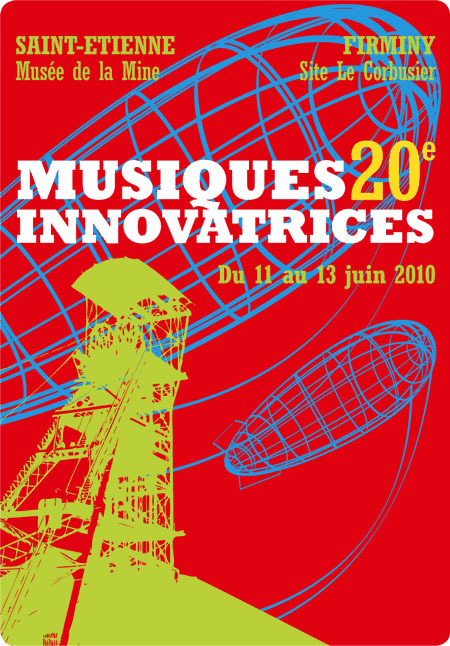 I will be acompanied by Sarah Hepburn on Vocals and Harmonium and Mikkel Elzer on Drums & electic Guitar. BACKDOOR Friday 26th at 22hr. I'll be playing a couple of shows in the UK with the delightful Doomed Bird of Providence and Harpoon Group, this autumn. Starting off at: The Colchester Arts Centre, Sept 13th & The Golden Lion, Todmorden, Friday Sept 15th. Todmorden is a couple of miles from Hebdon Bridge I believe. If everyones shedules and shows sync we hope to do some others together in November. 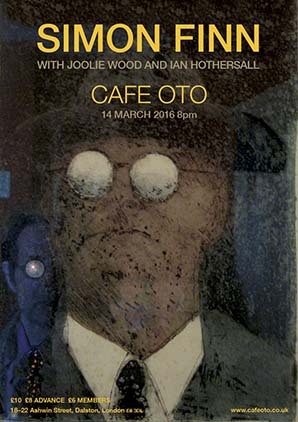 I'll be playing at Cafe Oto April 16th with Bob Theil, whom I look forward to hearing. That's Easter Sunday, by the way, so we can hopefully soften the blow for those that found no eggs. I will be doing a show in Rome, March 16th at "The Flying Donkey"
Thanks to Michal Porwet in Gdansk & Marcin Barski in Krakow for looking after me so well. It was wonderful to see both cities again, though one day I must arrange to be there in summer. It was very chilly. Thanks also to John Philips for his unexpectedly in depth review of the show for the Italian Insider. It lent my songs a rather more generous political bent than they've usually received, but I understand he's mainly a political correspondent for the Times & Independent. That said, I've never felt more political in my life than at the present time, so he was likely interpreting my unconscious. I should correct one detail in John's review - Though I would have been ecstatic to have been "mentored" by Leonard Cohen, I love his work, but in truth other than once delivering and helping him lay a Persian rug in his Montreal apt. 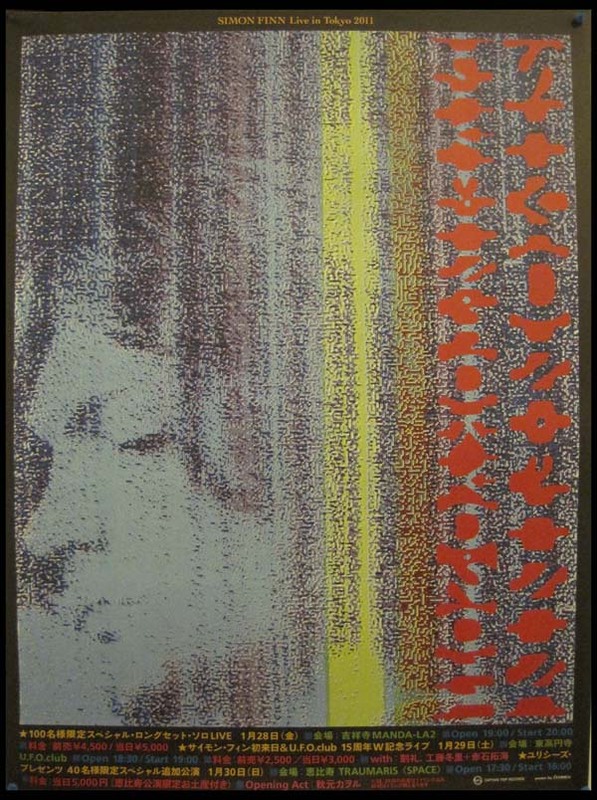 we only spent one night together; in the 80s with a mutual friend and poet Bill Fury, who'd introduced us. He was both delightful, and delightfully intelligent, qualities we could use a lot more of in the world at the moment. 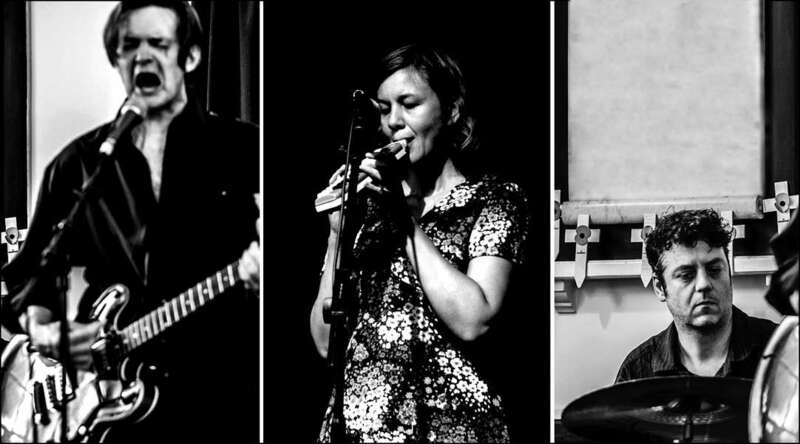 We will also play the Colchester Arts Centre, June 30th 2016.
at The Jazz House: Mads Pedersen, Rasmus Steffensen, & Andreas Korsgaard Rasmussen, & Anders Feerup for the most amazing sound with his collection of strategically placed & magical microphones. 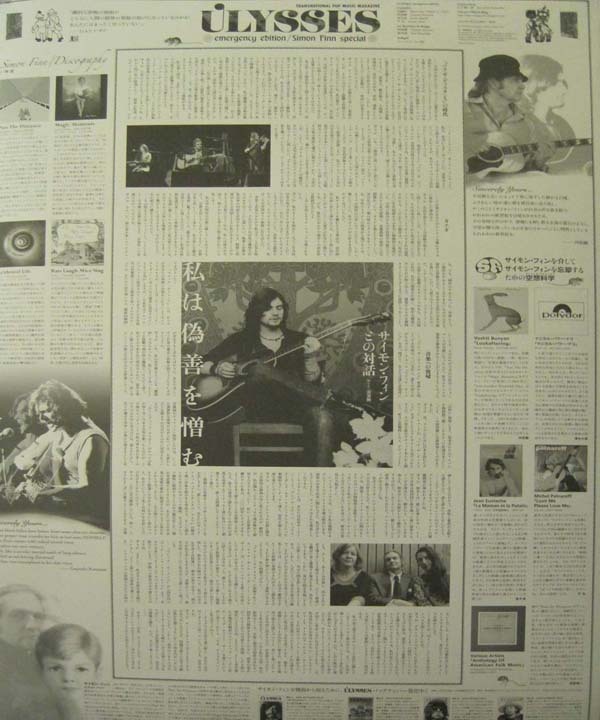 A real thrill to play acoustic guitar into. As it once was before the world of pick-ups intruded. Thanks to Michael Marino, who it gradually became clear to me not only runs the whole festival, books it, did our sound, and ten other things, but also has a relationship and children. And astonishingly was always smiling!. Thanks, Michael for everything. An inspiration. And of course, as always, Sarah & Mikkel, Blood on a Feather, who made the both the practices & traveling as enjoyable as the shows. And the shows were really great! We will do others! I will be playing two shows in Denmark in January which I am very much looking forward to; both shows will be as a group with the inventive sounds and percussion of Sarah Hepburn and Mikkel Elzer of Blood on a Feather. 25th Oct: Colchester Arts Centre 12 noon. l'll be hosting an evening celebrating The Beatles album Revolver at the Colchester Arts Centre this sunday (25th Oct). Playing it recently induced many eidetic and surprisingly pleasant memories for me. I should probably play a couple of other albums some time. The original vinyl album will be played in entirety. 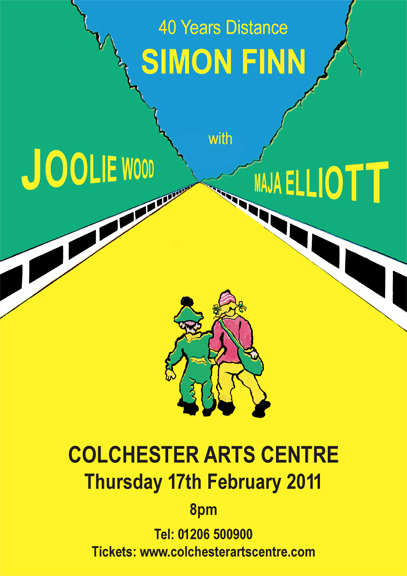 Joolie (Wood) will be singing and playing at the Colchester Arts Centre on April 17th. Mark Kluzek (The Doomed Birds of Providence) and I will be joining her on stage, Mark on accordion myself on electric guitar. Joolie's voice has always held for me a special quality of unflinching vulnerability and I always look forward to hearing it. I think this will be the first time Joolie's had an accordion player in her group, it works wonderfully; and Mark is real pleasure to rehearse with. 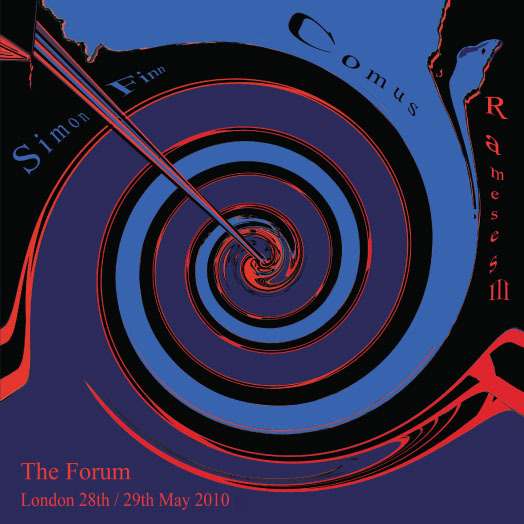 Another bit of Cafe Oto news. 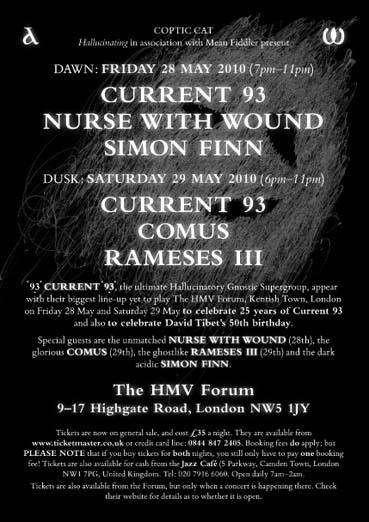 David Toop will be joining us on a couple of songs from Pass the Distance. David and I haven't played together live for 45 years! We met up recently to try and work out what key, if any, we'd played them in. Once that was sorted it all seemed to fall into place wondrously smoothly. Dec 2nd, 2014: Colchester Arts Centre - The Arts Centre is always a luxury to play. It has lovely people and fabulous sound. 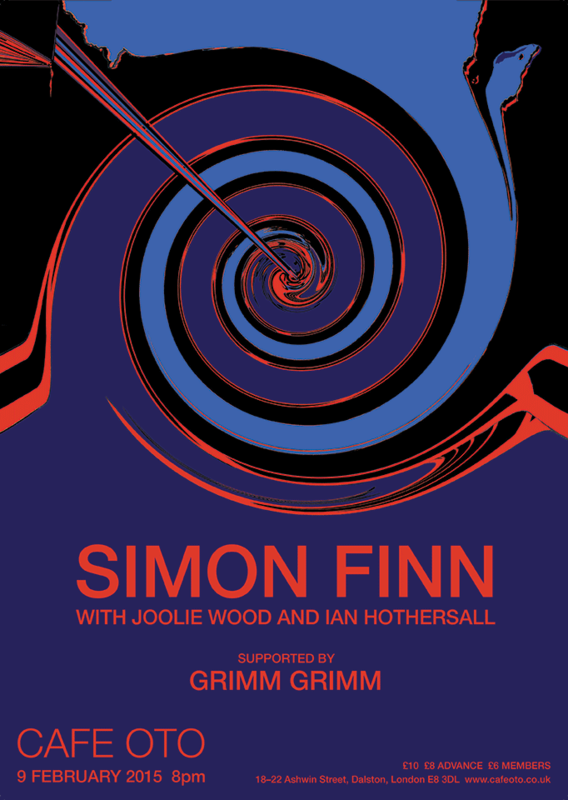 This show will be with Joolie Wood & Ian Hothersal on Drums, and I will be playing a mix of electric and acoustic. 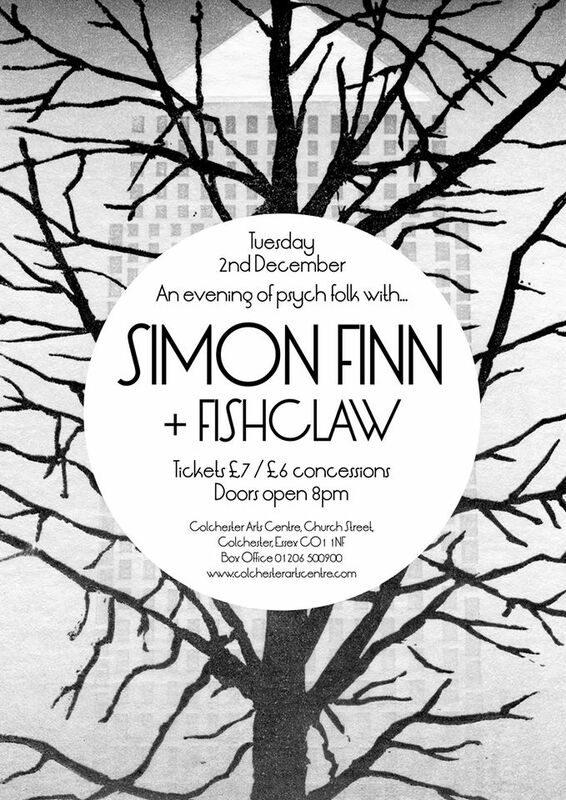 Also playing will be Fishclaw, a group I heard for the first time two months ago and loved. Leigh-on-Sea folk festival: June 30th. I understand there are a number of venues. I will be playing in the church at 5pm on Sunday. Colchester Arts Centre: August 21st. I will be back in Canada Sept 17th. Before I leave I will be doing a "plugged" experimental set at the Colchester Arts Centre opening for United Bible Studies. Whom I look forward to hearing. I haven't seen Alison since Nidge's birthdays party. By "experimental" I mean only that I will be playing an electric guitar and be playing a some songs I've not previously used mixec with some longer and different versions of songs I have used. I will be arriving in Montreal, Sept 24th. It will be really wonderful to see everyone again. The Fano festival was a wonderful experience in every way; as part of the show, part of the audience, and part tourist. Thank you Rasmus (Steffensen) for a really enjoyable and unique few days. It was wonderful to spend as relaxed a time with so much music and energy. The festival seemed to have worked as a very succesful human filter. Virtually all the people attending, either as players or audience, were talented and/or interesting and/or delightful to be around. I also want to thank Blood on a Feather, (Sarah & Mikkel) for being kind enough to join Joolie and I, on top of doing their own set. Thank you!! It worked very well and with your permission we will do it again! 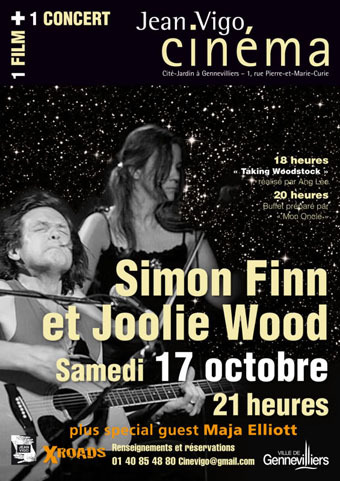 Joolie and I will be playing at the Fano Festival on Fano Island, in Denmark. I am not sure which day yet. Joolie will also be doing her own set! And Sarah Loraine Hepburn will be playing with us. Both on my own set and on Joolie's. Sarah played and sang with me last time I came to Copenhagen and is fab! We all had a really fabulous time in Spain thanks to so many people's effort. A really big thank you to Edu at Girodisco for putting everyone together as well as aranging the Madrid show. Marta & Alfredo, the dinner you took us all too afterwards in Vitorio we are still talking about. Alex thank you for an amazing lunch, we loved your bar (and John!). Ivan thank you for Santiago, and Brandan for his kindness, everything was so perfect. My only sadness is that I should have stayed a little longer! And thanks too to Nidge, for being the world's best road manager, and keeping us all sane and on-board. 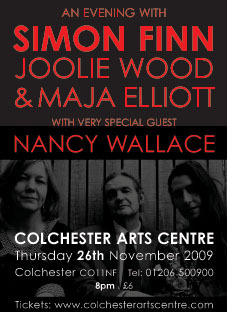 Joolie, Maja and I will be doing a show at the Colchester Arts Centre. It is one of the loveliest venues in the UK and the sound is always wonderful there. If I'm lucky there will also be someone with one of my favourite voices playing. 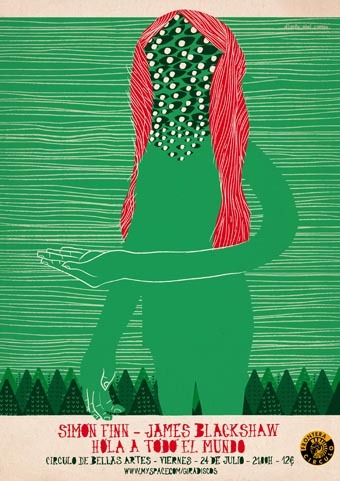 Lille and Copenhagen were both really wonderful shows and lovely places to play. In Copenhagen: thank you to Mads & Lasse and to Klaus at the Studenterhuset, it is the 3rd time playing there and it has been perfect each time. And a very big thank you to Sarah Hepburn for being kind enough to add her lovely voice and instraments to brighten some of my songs . 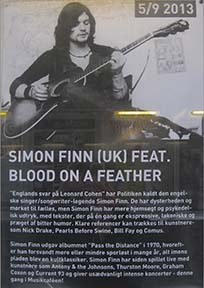 And thanks to Aron and Blood on a Feather for playing. In Lille: Thanks to Arthur for arranging everything, and Guillaume, "Radio" Charles (I'm a terrible interviewee!) and Le Malterie for hosting the show, Thanks to Raphaelle for doing sound. And the incredible audience for their warmth; your encores used up all the songs I'd rehearsed. So a big thank you to the person who saved my life by suggesting I repeat a song. 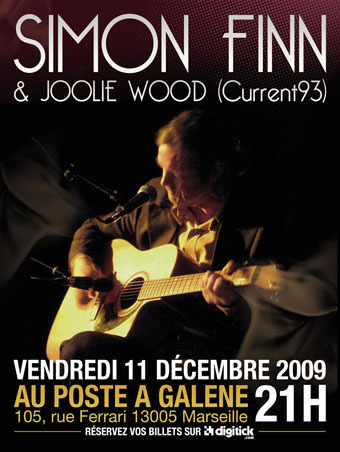 In a couple of weeks I will be heading off to Spain with Joolie (Wood), Maja (Elliott) for the below shows. Nidge Ince will be accompanying us as our, badly needed, tour manager. Mar 18th - Santiago, Spain Theatre Principal Compostella. Thanks Jenna for your work, and Rich for arranging Cafe Oto. And as always special thanks to Joolie & Maja whose voices and playing were truly amazing. A 3rd night in Tokyo has now been added.